A real swifty in her. Nice pub interior. Busy mid evening, we ventured into the far end of the left side bar and shared a table with a couple of jolly ladies. Sambrook's - Watneys Ray of Sunshine 3.80 Light and refreshing citrus combined with a bready yeasty flavour. Mid afternoon to early evening, fairly quiet a couple of others joined us here so we stayed a bit longer than planned. Three Sods - BoHo Bitter 4.10 Tangerine and grassy combined with warm malts and bitterness. First visit here since the Flying Scotsman days - I was expecting a trendy IKEA showroom conversion but was pleasantly surprised. Late lunchtime and fairly quiet. Sambrook's - Watneys Pale Ale 4.20 Rather bland, lacking aroma with just a hint of dry hoppiness. According to What Pub this place should open at 12:00, a group of nine of us stood outside until approximately 12:15, gave up waiting for it to open and headed to the nearby Charles 1. There was somebody behind the counter who had spotted us waiting but did not even bother to acknowledge us. Just before 11pm before my train. Tired atmosphere and bar staff. Pint of “Scottish Stores Pale Ale” which was good. Didn’t note other beers on. Hammerton - N1 4.10 Thick sludge - changed without fuss but really shouldn’t have made it to a customer. I had been told earlier in the day that this pub has a new manager who has no interest in real ale so I decided that rather than listen to rumour I would pop in and find out for myself. True it does have a new manager but a report that the place no longer offers Camra discount proved wrong. A good selection of ales and a selection of Available Soons that a certain well known pub company would have been proud of. 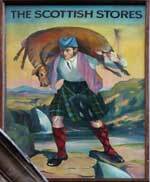 There was also a house beer named Scottish Stores Pale Ale at 4.2% but no indication of its true provenance. Mid afternoon, swift visit to show this pub off to my brother-in-law. Fairly quiet. Couple of other seasonal ales on with suitably silly names. Thursday evening and very busy. I have not listed all the beers available. Evening - swift half before my train. Couple of other ales on. The pub is found in Pentonville, Central London, N1 9DU. 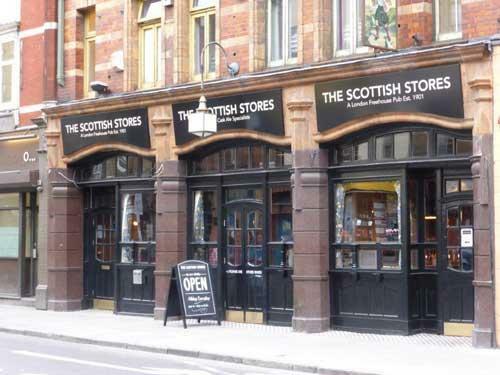 The Scottish Stores was present at the southern end of Caledonian Road by 1880 and was rebuilt in its present form in 1901. In the late-twentieth century it was renamed the Flying Scotsman and earned its trade as a strippers’ pub, its interior sealed off behind thick curtains. A change of direction came in 2015 and in December the pub re-opened after a careful restoration and back under its proper name. The focus is now on beer. The building is Grade II-listed, with a beautifully-tiled exterior and a well-preserved interior. There are three small, wood-panelled bars and an Arts & Crafts feel to the décor. A roof garden is expected to open in the summer months. The pub has an association, through its landlord, with the Ripple Steam Brewery of Deal, Kent. 8 handpumps in the front room. 10% discount for card carrying CAMRA members. We have visited this pub 24 times, seen 58 different beers and tried 24 of them.